The painting above by J.W. 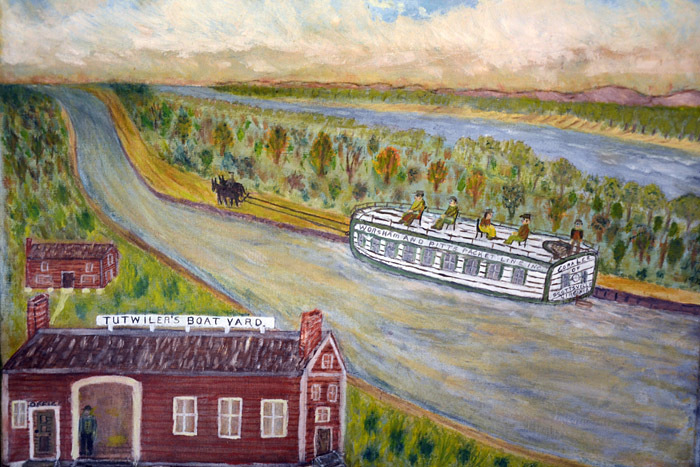 Tutwiler depicts the Tutwiler Boat Yard in Scottsville which was owned and operated by Wesley Clark Tutwiler until his death in 1871. After his passing, Wesley's wife, Amanda Marie (Moon) Tutwiler, operated this boatyard that built and repaired canal boats for use on the James River and Kanawha Canal between Richmond and Lynchburg until the canal closed in 1880. "The Booming Scottsville of the 1840's"
The past - and not so terribly long ago - is not just a different time, it's a different world. Scottsville without cars and paved roads, electricity and running water, certainly no Wi-Fi, TV, or Chinese carry-out, but still busy and engaged in everyday routines, going to school and the shops and to work, listening for the "trahn-ahn-ahn" of the ten-foot long, tin packet boat horn as another craft comes into town, calling for the canal's lock keeper. This is the world of Scottsville in the 1840's and 50's. Despite improvements to river traffic along the rival Rivanna River, as John Hammond Moore notes in his book, Albemarle, Jefferson's County, 1727-1976, "Scottsville continued to prosper." The James River and Kanawha Canal from Richmond to Lynchburg opened in 1840; the Plank Road - planked at least a part of the way from the Rockfish Gap to Scottsville - brought more and more of the Valley's produce to town for shipment to the capital and markets to the west. Moore writes that "a traveler reported in May 1845 that he saw at least 50 heavy wagons on [the road], and in 1850, after continued improvements to the turnpike, "70 mountain wagons" were counted one day in Scottsville. The produce of the fertile Shenandoah Valley, wheat, tobacco, meat, bees wax and more, was loaded on boats from warehouses around the canal turning base, now the grassy heart of Canal Basin Square in Scottsville. Flour was inspected, an important activity for the town's economic life, and the prosperity all this trade generated gave Scottsville "twenty-one stores, twenty-four mechanics shops of various kinds, three taverns, a tobacco factory and four churches. Canal transportation eastward was conducted by nine freight boats and two packets. Produce and freight valued at over one million dollars was being shipped annually," according to Moore. Partaking of this prosperity, and adding to it, was the Tutwiler family. Martin Tutwiler (1793-1864) and his wife, Maria Laforce Shores (1799-1873), owned property on both sides of Scottsville's Main Street; in 1832, they sold a lot to the Methodist Church for its building. Martin ran "Tutwiler's Tanyard" and was a partner in a "100-foot-long tobacco storage" building, according to Tim Small, who is the co-project manager of Canal Basin Square in Scottsville. Some of Martin's property was in the path of the proposed canal, and he received money for it in compensation; he was also contracted to build several locks west of town and other canal-related structures, according to Tim's research. Martin's son, Wesley Clark Tutwiler, born in 1823, bought two partial lots on Main Street in 1860 (numbers 115 and 90 on the plat map of Scottsville) to open a boatyard serving the canal. (Tim identified this information in his research of deeds recorded in Fluvanna County, where the lots were then officially located.) This land is immediately south of the street at the termination of the Scottsville levee. When Wesley owned his boatyard, the property went from the edge of the canal and to Main Street. Currently, while Main Street is still in place, the canal has been replaced by the railroad named CSX, which owns most of the area that was once the Tutwiler Boatyard. Wesley married Amanda Maria Moon (1830-1891) on April 10, 1848, in Virginia. The U.S. Federal Census of 1860 lists Thomas P. Tutwiler, their eldest child, and five others, including their daughter Lily, who married Luther Pitts of Scottsville. An unrelated man, age 22, was living in the household as well. In total, Wesley and Amanda would have 10 children (Thomas Peyton; Richard D.; Mary Elizabeth; Amanda; Lillie D.; Frances; James Marion; Wesley Clark, Jr.; Willie M.; and Margaret Willie Tutwiler). Wesley was astute enough to make "special precautions to ensure his wife�would retain control and profit from his investments, most notably the Boatyard," Tim writes. "After her husband died in 1871 at the age of 48 years, she, only months younger, continued to operate the yard until the closing of the canal a decade later." Tim has found other documents detailing the work of the boatyard, and much of his research appears in the informative plaques at Canal Basin Square in Scottsville. "The new Cora Lee sold for $975; the R.B. Snead, a full-sized deck boat was defaulted;�another new boat sold for $950�built by Tutwiler in the early 1870's." Toward the end of the canal period, the business would have been mostly in repair and sale of used boats. The exchange sold in 1874 for $900, and the full-decked R.E. Lee sold in 1873 for $350. Tim says that "John H. Briggs was superintendent of the yard and acted as agent in the sale of Tutwiler boats." Thomas, Wesley's son, later acted as agent in these boat sales. Other names associated with boat building in Scottsville, most likely at Tutwiler's, are William H. Anderson and Benjamin F. Tutwiler employed B.F. Daggett for lettering the boat's name, and said his "skill in this beautiful art cannot be excelled. He is entirely original in the conception of whatever work he undertakes." Much else must be left to conjecture. Even the oil painting by J.W. Tutwiler (shown above and on display in the Scottsville Museum) does not give us much information about the working of the business, though it shows the Cora Lee of Scottsville, Worsham and Pitts Packet Lines, passing two red-painted buildings (one with the sign 'Office' over the door) as it is pulled toward Richmond. The large freight and packet boats would likely have been built outdoors, and the forms and tools needed might have been kept in the largest building in the painting or the frame one that still exists on Scottsville's Main Street. The photograph below of a Milton, PA, boatyard shows such boats under construction-so big that ten men have ample room to use their adzes along the massive hull-in a dirt-bermed enclosure that could be broken open to float the finished boat access into the canal. Barry Long of Scottsville, who recently built two Melonseeds, a nineteenth century Chesapeake Bay gunning boat, talked about what sort of tools Tutwiler's men would have used. The drawknife and adze were necessary to shape the long planks of the hull and carve the stem, where the planks join at the front. Finishing would be done with hand planes. An internet source on boat building in the nineteenth century (gaudet.info/LEARNING) says "the average number of planes owned by the 'old time craftsman' is about fifty. Commonly used planes were the modeling, smoothing, rabbet, jack, long or trying, jointer or floor, and cooper's long jointer." Barry says that it is important to begin with well-seasoned, dry wood, which when put in water will swell to fill the seams. The seams are also caulked with cotton batting and a chisel-like tool called a caulking hammer. It is common, he notes, to work from a pattern for the ribs, so they are all alike; otherwise, a form around which the wood is bent could be employed, allowing the wood to take the shape it will. "In the end," Barry notes, "the wood will win, and take its own shape." In general, boat construction techniques in the nineteenth century were the same as other carpentry techniques, and most information and skills were passed on orally and by experience to apprentices. Construction practices probably varied from boatyard to boatyard. Barry suggests it might have been possible to erect a derrick to help in the heavy lifting, but says that most work was done by hand. 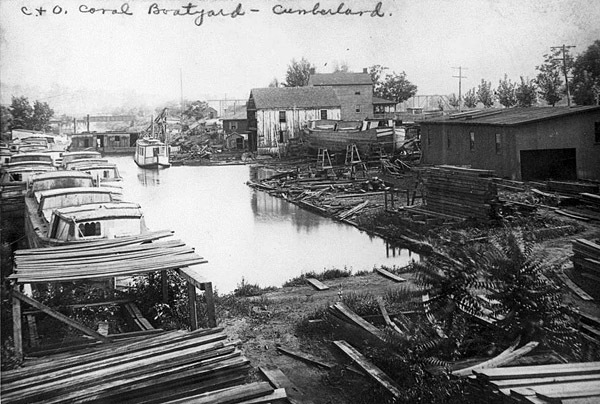 The boats needed large crews, and Scottsville was able to provide all kinds of workers for this phase of the canal economy. Tim points out that other support industries would have been found in Scottsville at the time: horse and mule stables, a brick kiln, iron forge; and other workers needed, including a toll taker at the gauging station and tobacco inspectors. Tim Small is constructing the packet boat to fill the northern-most boat slip at Canal Basin Square, using photographs of original boats. His objective is to make the craft look like an original, not necessarily to follow nineteenth-century building techniques. He plans to call it "The Lizzie" after a boat Tutwiler advertised as having "a name as sweet and dear as the boat is beautiful and good." White frame structure on Scottsville's Main Street which once part of Tutwiler boatyard, 2017. 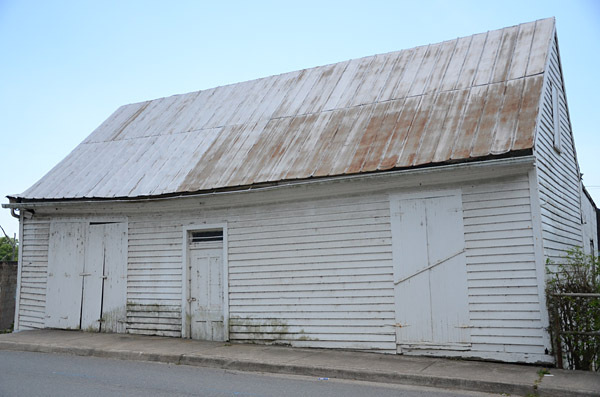 The white frame structure on Main Street, once part of the Tutwiler boatyard, is now owned by David Becker, Jr., who bought it from Jane Caldwell's estate. It is across the street from his house, and he uses it for storage; David says he's learned that the railroad also used it as their baggage claim area. There is a walled-off office in the south west corner. Newer shelves on the east walls attest to its use as a grocery store within memory of some Scottsville citizens, and Dave has found a sign on the rough plank floor suggesting it was a place that served breakfast at some point. The original part of the building has two floors built on a fieldstone foundation. There is a flue for a stove but no chimney. There are two additions toward the river, one in block and one metal; a second roof covers the original structure and the first addition. "The oldest part of the building is in better shape than the add-ons," Dave says, indicating the rotted floor joists. He has a number of deeds that came to him with the property, showing that it was sold by Helen and Charles Harris in 1907 to G.W. Lewis of Fluvanna for $200; that Dr. L.R. Stinson owned and sold it in 1917; and that Leonard Lewis sold it to J. Walter Moon for $500 in 1932. Dave, who grew up locally, "always playing on the river, the Rivanna or the James," says he now "gets on the river every chance I can, especially in my kayak." Using the James for recreation rather than work has been typical of the twentieth century, but Pat Pitts remembers when, boating as a boy, he would see few others except fishermen out on the river. He had a wooden rowboat made by local mail carrier, Pen Thomas, who lived nearby on Drivers Hill. His construction method, Pat recalls, was to pull out a piece of wood, look at it, and then cut it. "A damned good guess is better than a poor measurement any day," he told Pat, who has found that to be true. The boat Thomas made, "for the joy of it," was heavy, with oak gunnels but a marine plywood bottom; Pat's father had found the wood, and had Thomas build him a boat, too. The river continues to flow past Scottsville, bringing us riches even if it is not the basis of our economic prosperity. Our world changes, but remember what the Water Rat tells Mole in Kenneth Grahame's Wind in the Willows: "Believe me, my young friend, there's nothing-absolutely nothing-half so much worth doing as simply messing about in boats." Tutwiler Family Cemetery located on Poplar Spring Road (Rt. 637), Fluvanna Co., VA.
north of Main Street (Rt. 6) in Scottsville, VA.
19th Century Town on Limestone Run" by Homer F. Folk. "Canal Boat Building" by National Park Service, Dept. of Interior, U.S. Government - NPS.